UNITED NATIONS, March 22 -- Three weeks into the month that South Africa has the presidency of the Security Council, tensions with the veto-wielding Permanent Five members flared up Thursday around the draft Iran sanctions resolution. South African Ambassador Dumisani Kumalo had proposed a series of amendments, and on Thursday few were accepted, while the P-5 demanded a vote on the matter on Saturday. Ambassador Kumalo said if Iran's president wants to come, he better get moving now. 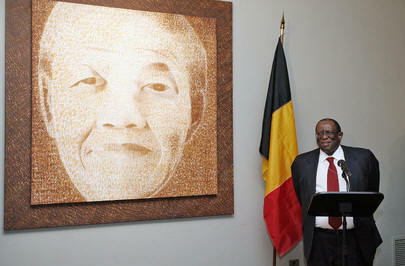 "They told us we would be negotiating a give and take," Ambassador Kumalo said. "We are learning we were fooled, in a way." In the Council's closed-down meeting, Inner City Press is told, discussions were heated, and representatives of Russia and China separated themselves from the U.S, France and UK. Still, it's pointed out that if China or Russia had wanted to stop or modify the resolution, they had ten days to do so. Others note that of the Council's membership, the main Muslim, Arab and African countries all have reservations. How then is it a global resolution? there had been scheduled for today a briefing about Zimbabwe but then it got changed because of the Iran resolution. Who is going to brief, who is doing that briefing? Spokesperson: Somebody, a senior official from the Office for the Coordination of Humanitarian Affairs. Inner City Press: Do you know who it is? Spokesperson: Well, it would have been the Deputy because Mr. [John] Holmes is currently in Khartoum. But you would have to ask the Council President about when it's been rescheduled for. The answer, it seems, is just maybe Friday, more probably next week. Amb. Kumalo and Mandela: What would Nelson do? Inner City Press: In the Ivory Coast, France has said it is going to draw down 500 of its troops. There were questions made by AU to the United Nations that UNOCI start pulling troops out. What is the Secretary or DPKO doing in light of this request? Spokesperson: I think right now, it has not been officially... as far as I know, the Security Council has not taken up that request. So, you probably have to see with them, what they are thinking on the future of the mission. UN Envoy Chissano Seeks Solution to Lord's Resistance Army, "Without Impunity"
UNITED NATIONS, March 22 -- The war crimes indictments against the leaders of Uganda's Lord's Resistance Army were gingerly discussed on Thursday by the UN's envoy to the LRA-affected areas, former Mozambican president Joaquim Chissano. After Mr. Chissano briefed the UN Security Council on his efforts to get the LRA back into peace talks and a ceasefire with the Ugandan government, Inner City Press asked him about the role of the International Criminal Court's indictments on the process. 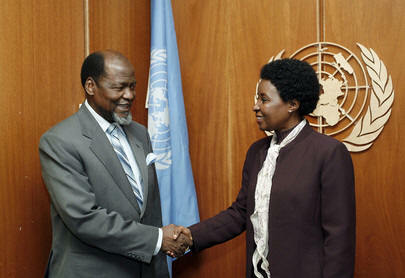 "The ICC cannot get involved in negotiations," Mr. Chissano quickly pointed out. Video here, from Minute 3:47. "The Uganda government is busy trying to study how to find an alternative solution, to take care of the question of non-impunity." Mr. Chissano was asked if the indictments pose an obstacle to the negotiations. Strangely, he downplayed what is widely described as a sticking point, and rather said that the only impact of the indictments was been that the five leaders indicted "cannot participate in the talks." To the contrary, an LRA representative to the talks, Godfrey Ayo, has been quoted that "It is the view of LRA that the ICC warrants of arrest is the greatest obstacle in all attempts geared towards ending the war in northern Uganda and bringing about peace in the region." Joseph Kony and Vincent Otti of the LRA have demanded that the indictments be quashed. More recently, they have called for the involvement in the talks of Ugandan president Yoweri Museveni's brother, General Salim Saleh. Mr. Chissano took only two questions, and then rushed with a small entourage into the Council to finalize a Presidential Statement, then to the UN's elevators. 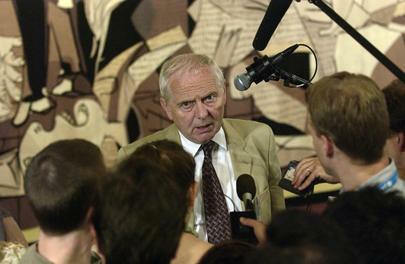 One wanted to ask for his views on the crisis in Zimbabwe, and perhaps even about the rifts in the Council on Iran. But Mr. Chissano was gone. In the run-up to his appearance, the UN Spokesperson's Office went to great lengths to point out that he is not a mediator, he is a facilitator. If the talks lead nowhere, it is not the UN's fault. "The UN has no direct involvement in the talks. Please contact the Mission of Sudan, as that country is hosting and organizing the peace talks, for any additional information on the alleged resumption of the talks." Mr. Chissano said, as an aside, that much of the LRA delegation in fact resides in Nairobi, Kenya, when not in Juba for the talks. Recently at the UN, in response to questions from Inner City Press, UN High Commissioner for Human Rights Louise Arbour called the LRA a criminal enterprise that should not be romanticized as a defender of Uganda's Acholi people. Earlier still, South African judge Richard Goldstone criticized UN officials who have met with Kony and Otti, saying that if such contacts are desired, the Security Council should formally suspend the ICC indictments for a year. While Mr. Chissano said the search of on for a "solution to the question of non-impunity," dissembling and murkiness hardly strengthen the rule of law. UNITED NATIONS, March 21 -- Following a Security Council meeting Wednesday afternoon about Iran, U.S. Ambassador Alejandro Wolff emerged and told reporters that there is still a possibility of a vote this week on the draft sanctions resolution, and that the afternoon's meetings were "not a negotiation session." Minutes later, South African Ambassador Dumisani Kumalo, the president of the Council this month, was asked about Wolff's comments. He asked rhetorically, if it was not a negotiation session, what was it? South Africa has issued a two-and-a-half page "non-paper" which proposes that a 90 day time out be built into the resolution, and would omit from the sanctions list several individuals and companies, including Bank Sepah, Qods Aeronautics Industries and Pars Aviation Services Company. Others are requesting that the resolution's proponents come forward with justification and proof about the names on the sanctions list. 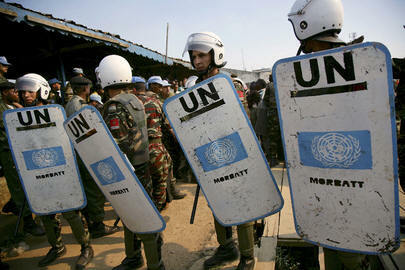 By Wednesday evening, the UN was full of competing theories on what will happened next. 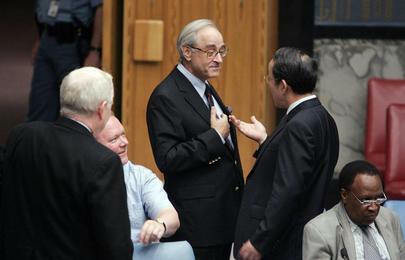 Some say that the resolution's proponents will put it "in blue" on Thursday night, and demand a vote within 24 hours. Others note that Ambassador Kumalo, as Council president, controls when meetings are scheduled, and at a minimum could hold off action until Iran's president, who has requested to address the Council before any vote of further sanctions. Further out, it is speculated that South Africa could run out the clock until the end of their month heading the Council, and that the UK, which chairs the Council in April, would preside over the sanctions' enactment. We'll see. In the eddies of this jousting about the Iran nuclear sanctions resolution, the issue of Zimbabwe is being buffeted about like a homeless cause. A briefing of the Security Council about recent events in Zimbabwe -- the arrest and beating of opposition leaders, the crackdown on the press, the economic collapse -- had been scheduled for Thursday afternoon. It will no longer take place, at least at that time. Ambassador Kumalo Wednesday evening that "the UK had wanted a briefing on Zimbabwe, that's not going to happen now." Amb. Kumalo has previously been heard by correspondents to say that Robert Mugabe is just a grumpy old man who should be allowed to serve out his time. Soon after Ambassador Kumalo's comments, Inner City Press asked UK Ambassador Emyr Jones Parry about the status of the briefing on Zimbabwe, and any linkage to the negotiations around the Iran sanctions resolution. Ambassador Jones Parry said that because the Iran text will now been discussed on Thursday afternoon, the Zimbabwe briefing was bumped. He said he has requested that it take place, if possible, on Thursday morning, or at the soonest possible time thereafter. At 7 p.m., Thursday's Council scheduled was released, with Zimbabwe not included in the morning or afternoon session. (Northern Uganda / the Great Lakes, a euphemism for the Lord's Resistance Army conflict, remains on the agency for a briefing at 4 p.m., click here for today's Inner City Press coverage of LRA, Joaquim Chissano and Deputy Secretary General Asha-Rose Migiro.) Given South Africa's position that Zimbabwe issues do not belong in the Security Council, it remains to be seen what happens with the Zimbabwe issues now. One update on a less prominent hotspot: earlier in the week, Inner City Press asked Russian Ambassador Churkin when Abkhazia will be considered by the Council, given the request by Georgia after the contested elections in the region, and the bombing incident which the UN says its is investigating. "It's on the agenda for next week," Ambassador Churkin said, then amended the answer to "next month." What will Kosovo, the issues are piling up. We'll see.